Vienna. A city filled with beautiful old and historical buildings, statues in Baroque style, old churches, and fairy-tale looking palaces. No wonder its fame has attracted tourists from all over the world. It’s the capital and largest city in Austria and has ranked number one as the world’s most livable cities in the world for numerous times! 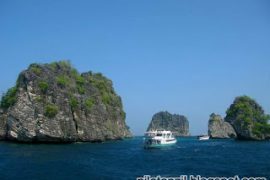 Planning to visit this beautiful place? 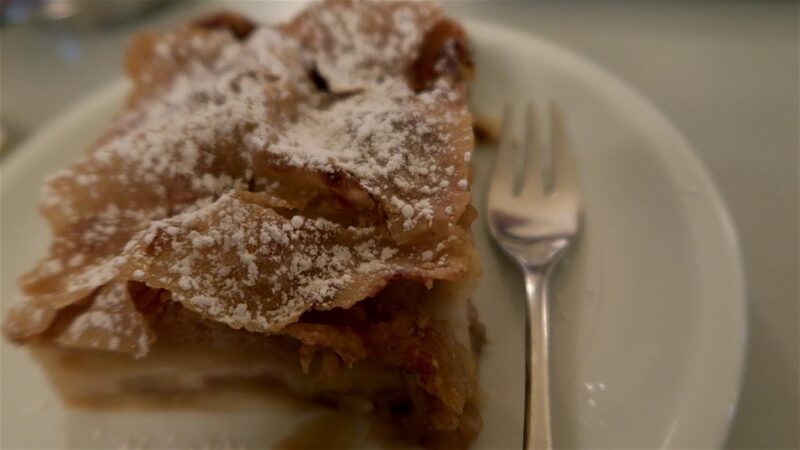 Here are my list of top 10 things to do in Vienna. Vienna’s city center (Old Town) was designated as UNESCO World Heritage Site in 2001. It’s worth taking your time to do a walking tour around the Old Town and learn about the history and interesting stories from the local guide. 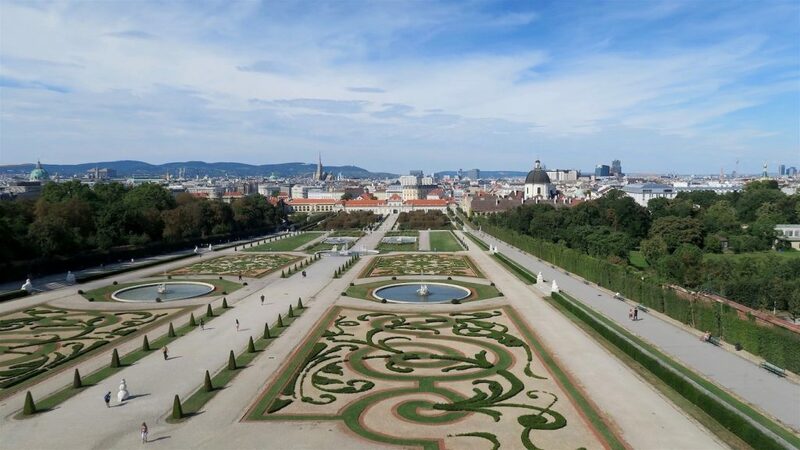 We spent 8 days in Vienna and managed to visit two beautiful palaces, which were the Schonbrunn Palace and Belvedere Palace. Both palaces are equally beautiful. 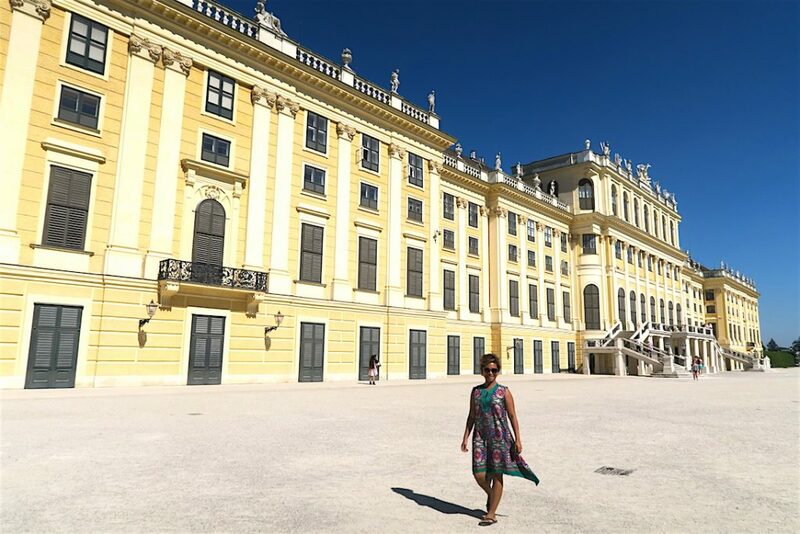 At the Schonbrunn Palace, I recommend you to take the “Grand Tour” to visit over 40 rooms — the rooms where Princess Sisi used to live, the Prince used to study, etc. The most breathtaking room for me is the Dancing Hall/Ballroom. Entering this room making me feel like being invited to a dance party by the royal family! The size of the room, the interior design, the decoration, the impressive chandelier, every single thing in this room is glamourous. Back in the days, the royal family often held parties here and they all danced together. How nice! Visiting the Schonbrunn Palace is worth it because we learn so much about how the royal family used to live, the history, and some small but interesting stories — such as Mozart played in one of the rooms for the first time here when he was 6 years old! Isn’t it impressive? It’s also listed as a UNESCO World Heritage Site in 1996. Visiting the Belvedere Palace was a totally different experience than the visit to Schonbrunn Palace. 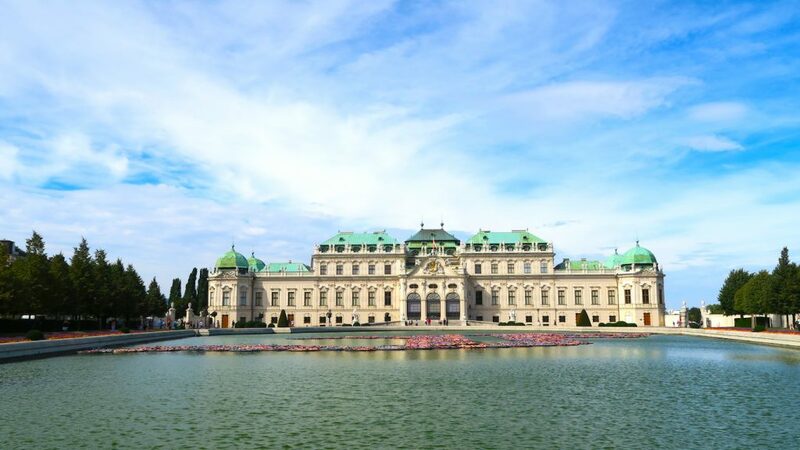 Belvedere Palace is considered as one of Europe’s most stunning Baroque landmarks, comprising the Upper and Lower Belvedere and an extensive garden. It’s also listed as a UNESCO World Heritage Site. Today, the palace is more like an art museum. It houses the most famous painting in this country, Der Kuss (The Kiss) by Gustav Klimt. This painting has become the icon of Vienna. Not only Der Kuss, there are other paintings by Gustav Klimt in this palace. Among my favorite is a painting titled “Girlfriends” — made with watercolor. It’s soooo beautiful! You could easily spend a few hours here if you’re into paintings and art. There are different rooms showcasing the greatest collection of Austrian art dating from the Middle Ages to the present day (paintings, statues, religious objects, etc), as well as work of international artists such as Claude Monet and Van Gogh. Don’t forget to get the audio guide! The palace also has beautiful hall. Check out the fresco on the ceiling! It’s sooo gorgeous! And I also love the little chapel that was built in 1723 and was reserved for the daily prayers of Prince Eugene of Savoy. For some reasons, this bling-bling chapel has an intimate vibe. 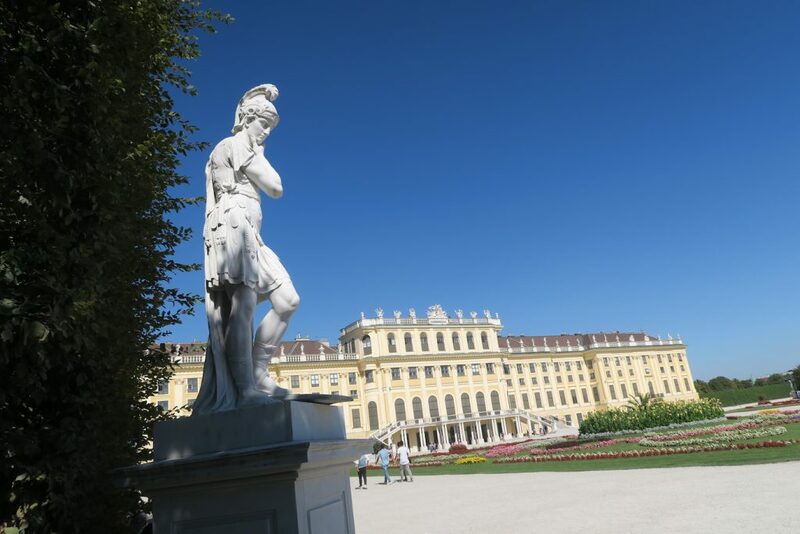 Ticket for the Upper Belvedere is 14 Euro/person for adult. Go to Tiergarten Schonbrunn Zoo, the Oldest Zoo in The World! While in Vienna, why not visiting the oldest zoo in the world? Tiergarten Schonbrunn Zoo was originally a menagerie of “rare animals” for the imperial family back in 1752, built by Emperor Franz I, Stephan von Lothringen, the husband of Maria Theresia.And over the last 260 years, the zoo has become one of the most modern and beautiful zoos in the world. However, the imperial touch can still be seen today. Pay attention to the details of this zoo, then you’ll notice that it used to be owned and reserved only for the royal family :). Yes, this is in the zoo! Tickets : 18.50 Euro/person for adult; Children and adolescent is 9 Euro; Children under 6 years old is free :). Open daily from 9am to 4.30pm or 6pm – depending on the season. 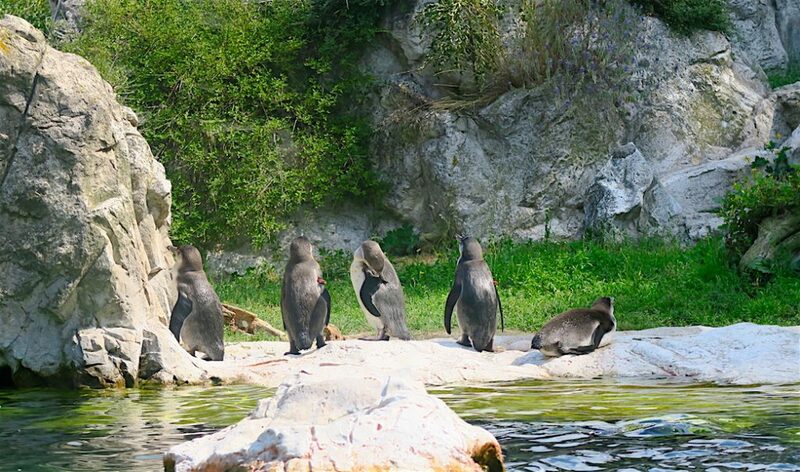 Top 10 things to do in Vienna: visit the Tiergarten Schonbrunn Zoo. 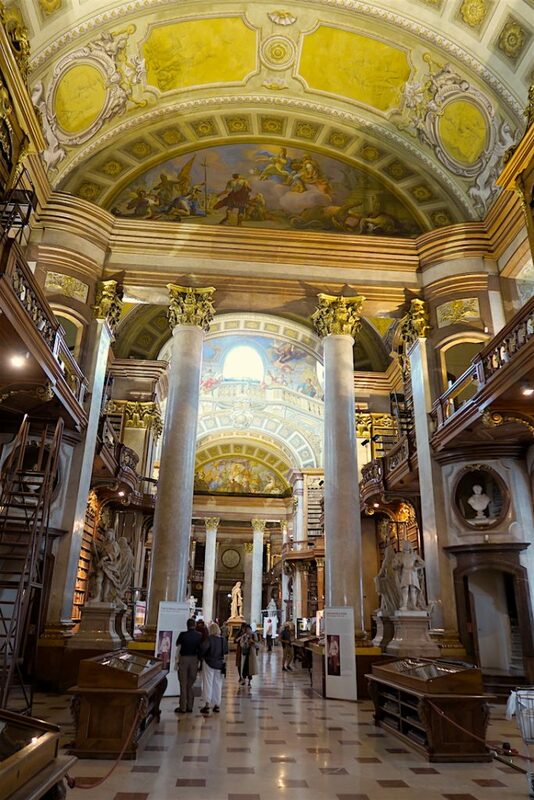 Vienna has one of the most beautiful libraries in the world. A visit to the State Hall of Austrian Nationalbibliothek is definitely a must! Located at the Hofburg Palace, this is one of the most mind-blowing places I’ve ever been. Check out our #HeSaidSheSaid post on the National Bibliotheek for our impressions on this gorgeous place! Ticket: 7 Euro per person for adults. 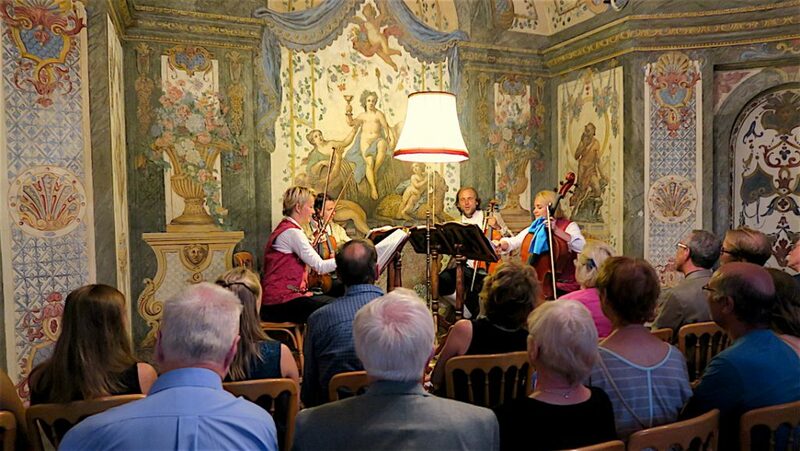 Enjoy the Classical Concert at Mozarthaus. Vienna is the world’s music capital. Legendary composers such as Mozart, Beethoven, Schubert, Johann Strauss I, Johan Strauss II, were among them who had lived and worked here.One of the perks of visiting Vienna is you can enjoy classical concerts every single day! There are plenty of places offering classical concerts, so be wise in choosing which one you’d go, because some of them can be touristy and tacky (so I read on the internet). After doing my research, I choose to go to “Konzerte im Mozarthaus“. 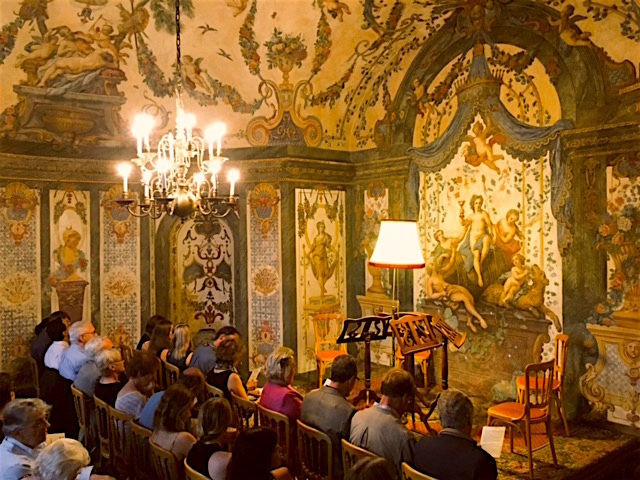 The concert takes place in Sala Terena, the oldest concert hall in Vienna where Mozart used to work and play for Bishop Colloredo in 1781. Mozart used to live in this house, too, in a small apartment that is now become a monastery. Sala Terena itself is a baroque jewel, designed and painted in the second half of the 18th Century. The frescoes are still beautifully well intact. Impressive! The hall is not big, yet it’s very pretty and it offers you an intimate vibe. Even Mozart appreciated the wonderful acoustics and the incomparable atmosphere of Sala Terena. Sala Terena, the oldest concert hall in Vienna. 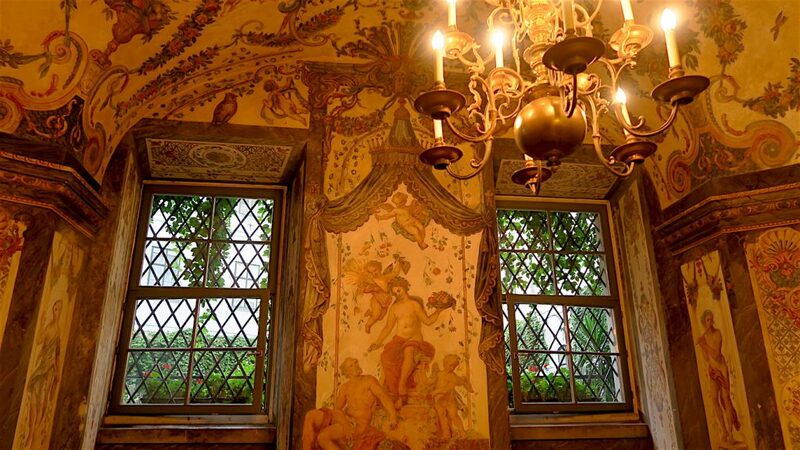 Sala Terena is fully decorated with frescoes back from the 17th Century. Sala Terena’s frescoes and chandelier. So beautiful! The one hour concert was totally worth it. The “Mozart Ensemble” that consists of four experienced musicians that night played some pieces from Mozart, Antonin Dvorak, and J.Haydn. 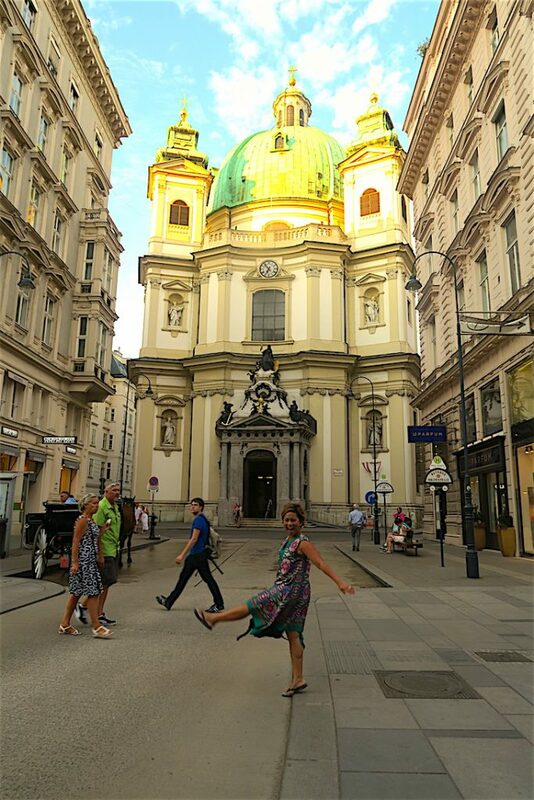 It’s definitely a wonderful one hour to spend in Vienna! Being in the oldest concert hall in town and ears are spoiled by the enchanting music are like feeding fresh drinks to your soul. You can buy the ticket online. Tickets: 59 Euro (row 1-3); 49 Euro (row 4-6). For students: 39 Euro. 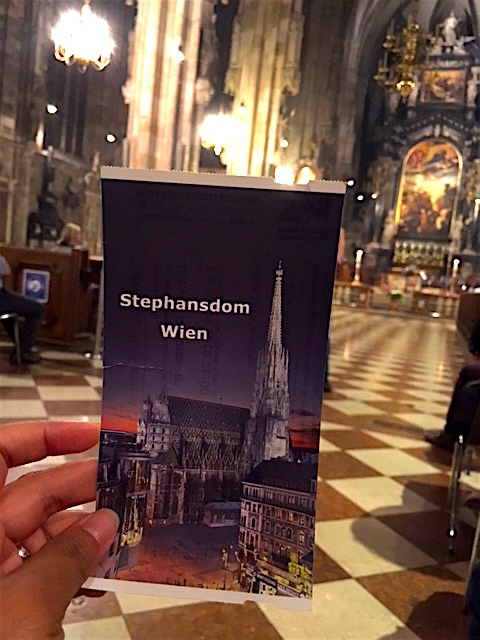 St. Stephen’s Cathedral, or also known as the St. Stephansdom, is the symbol of Vienna. You should definitely visit this church! 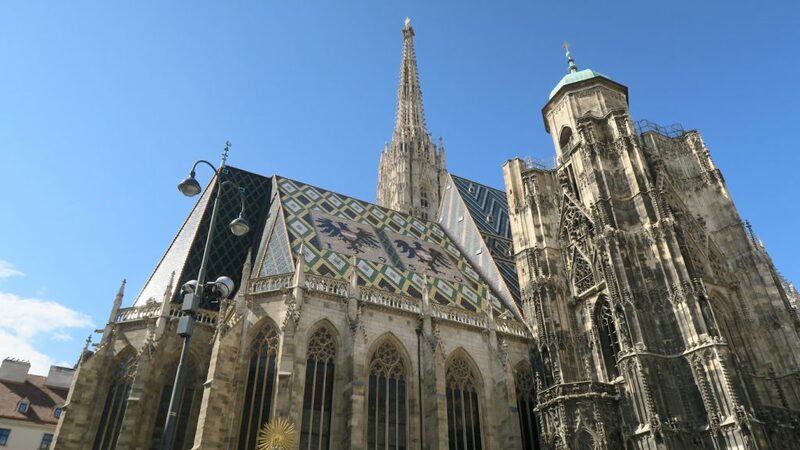 It’s one of the most important Gothic structures in Austria. The construction started in the 12th Century, however, during the Second World War, this beautiful church was severely damaged by fire. But everyone lending a hand, the cathedral was rebuilt in just seven years. What’s more impressive than being in such an impressive Gothic church and listening to beautiful classical tunes at the same time? The classical concerts in St. Stephen’s Cathedral is one of the most favorite concerts among the locals. It’s not too touristy, so of course I wouldn’t miss it for the world! And… all the reviews are right. The classical concert here is magical! With five recognized musicians playing the famous Vivaldi’s Four Seasons in the altar, the music echoes all through the church. It sounds like all the pillars are singing! Truly amazing. LOVE LOVE LOVEEE IT! You should definitely check it out, too! Tickets: 38 Euro (A row) and 28 Euro per person. 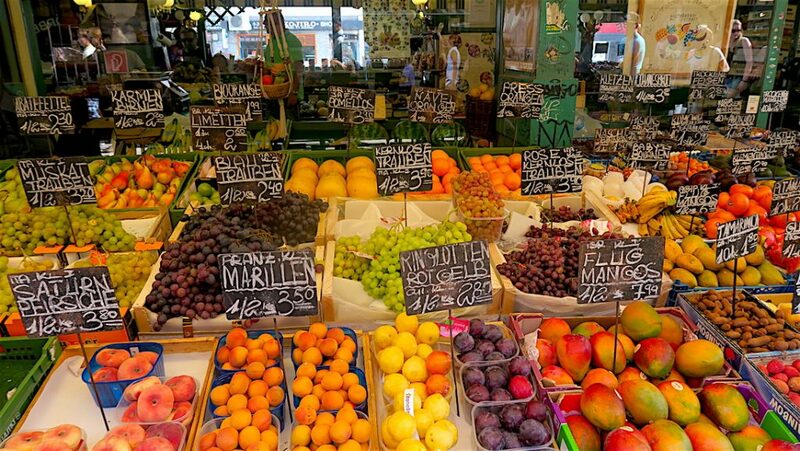 Naschmarkt is the most famous open market in Vienna, if not in Austria and has been around since 1780! It has a wide range of things to see, different types of food to enjoy, all kind of beverages to drink, and plenty of stuff to see and to buy! 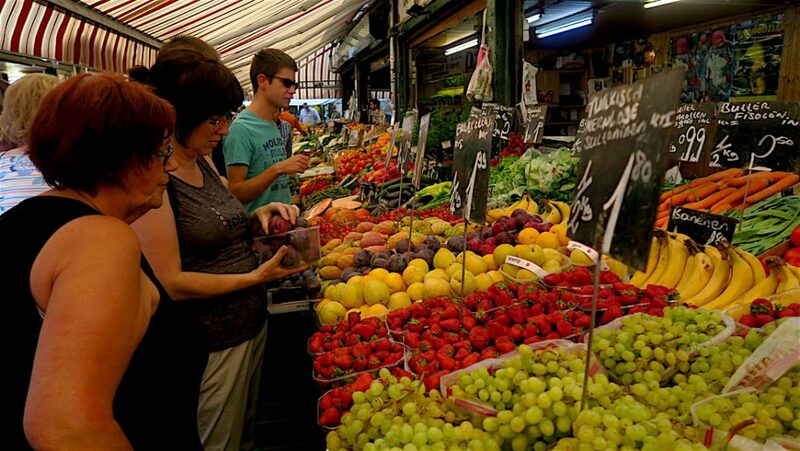 My recommendation is to go in the morning when the market is not too crowded. It can be hard to walk as the day goes by due to the number of visitors going to this place. Plenty of food carts and shops on your left and right sides, leaving only a narrow alley for you to walk – squeezed by the other visitors also trying to go in the same direction, if not, the other direction! xD But hey, that’s part of the experience, right? I just can’t stop looking and drooling at the food. From hummus, baclava, tapas, falafel to steak. They have all the food you could imagine! Drooling drooling drooling!! Also all kind of snacks you can handle. Definitely dangerous if you’re on a food diet! 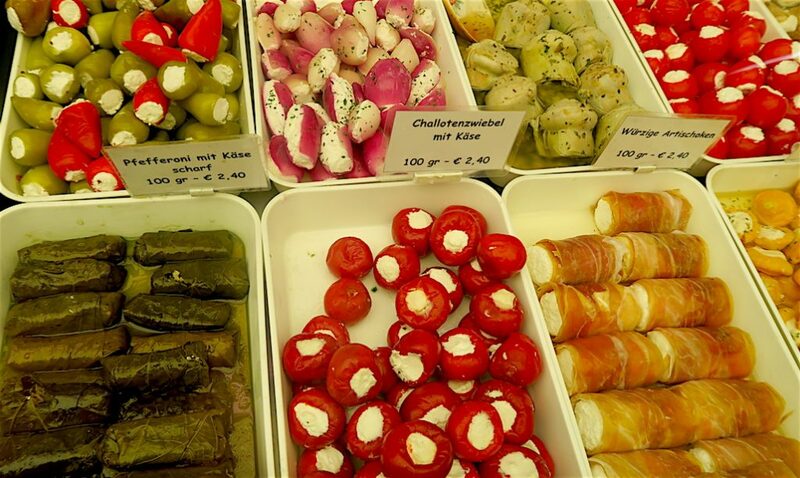 Hahaha..
You can basically find all kind of food in Naschmarkt! On the back of the market, you’ll find a flea market with all kind of junk you can buy! 😀 It’s like going to an antique shop or to your grandma’s house 😀 I also enjoy watching the gypsies looking for a hidden treasure here in the market :). Of all the junk in the flea market part, this is the only one I like! 😀 This guy claims he made all of these cool boards. 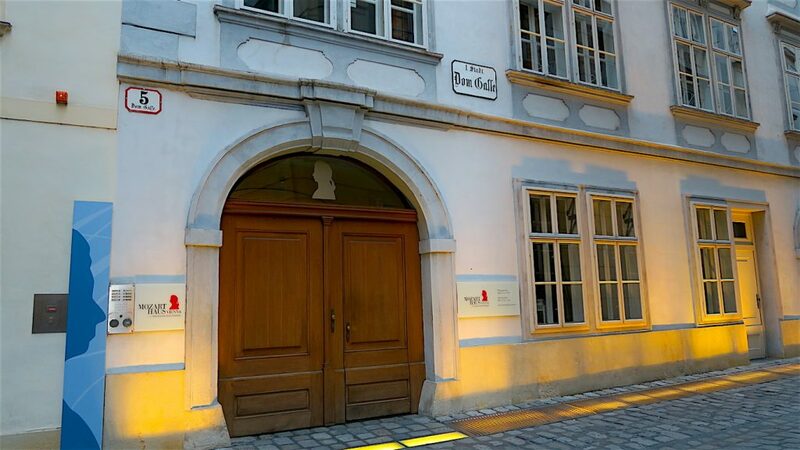 If you’re into classical music, of course you wouldn’t miss an opportunity to visit Mozart’s house, right?Mozart and his family lived here from 1784 to 1787. 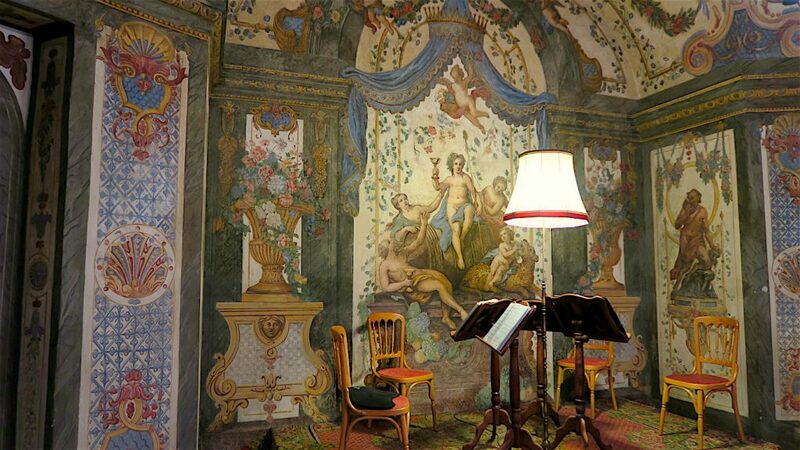 During this period, Mozart was already famous and thus, he could afford living in this elegant apartment. It’s the largest and most expensive apartment ever occupied by him and the only one that’s still intact today.He wrote the famous “The Marriage of Figaro” here, in this house. And you can see his work, his writing, and learn more about his life, too. I learn that Mozart loves to party, inviting his friends to come to his house for drinks, play, and listen to his music. He also had friends staying at his house, sometimes for long stay, too! What a good guy, he was! And apparently, in the afternoon, he often gave private piano lessons to students, but tried to leave his mornings empty so he could compose his music. He was a workaholic, too. He could produce 6 sheets per day – putting his mind and soul in his music! His house consists of four large rooms, two small ones and a kitchen. Unfortunately, visitors are not allowed to take pictures inside the house. We can only take pictures in the hallway or staircase :D. So, sorry guys, no pictures of his bedroom, dining room, and playing/party room! I’m about to enter Mozart’s apartment :). Knock.. knock! Here we can also see a magnificent musical clock made around 1790. Mozart is believed to have composed for this clock. Beautiful tunes, definitely. Ticket: 11 Euro for adult. Explore the ring road on this legendary ring tram! 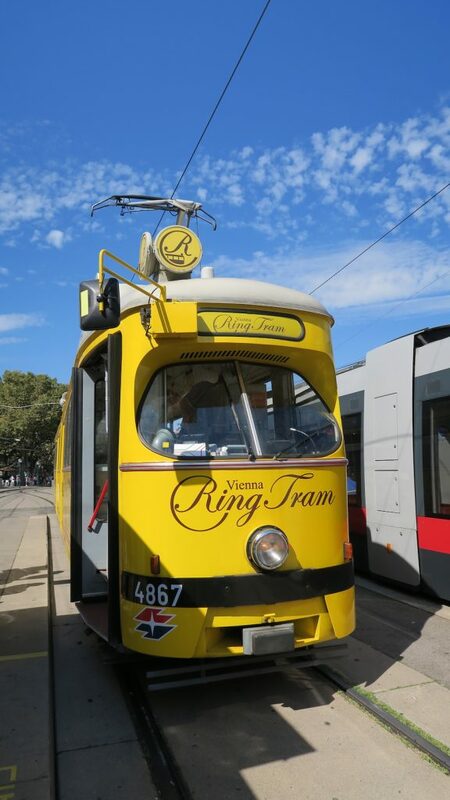 This old yellow tram will take you to the Vienna Ring, Austrian Heritage Site.During the 20 minute-ride, you will see the Vienna State Opera, Imperial Palace, Parliament, City hall, Burgtheater, Stock exchange and other historical places.How to catch this tram? The Ring Tram goes on a lap and departs every every 30 minutes from Schwedenplatz. You can buy the ticket on the tram. Ticket: 9 Euro per person, includes an audio guide. 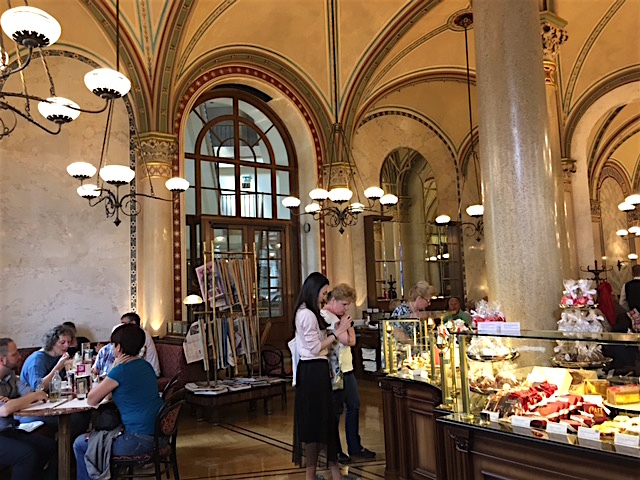 Last but not least on my top 10 things to do in Vienna is something that you could enjoy every single day of your holiday there!There are plenty of charming coffee houses in Vienna. Some of them are known as institution coffee houses. 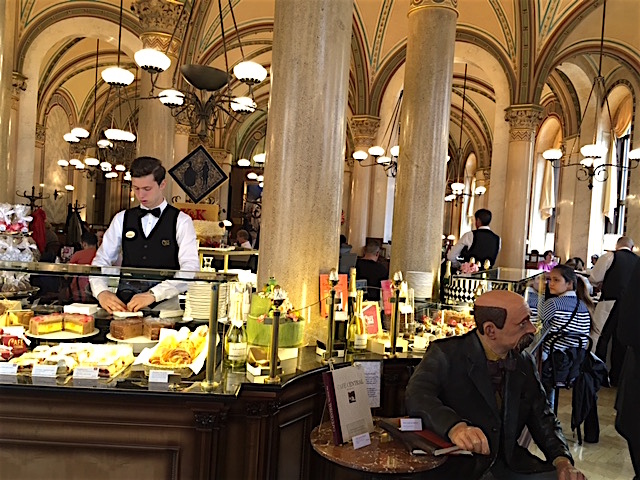 These coffee houses play an important role in shaping Viennese culture. The locals love spending time in a coffee house, to chat, play cards or other board games, while sipping a cup of coffee and munching the tasty desserts.The Viennese coffee house is described as a place “where time and space are consumed, but only the coffee is found on the bill” 😀 The most famous one is Cafe Central where Sigmund Freud and Trotsky used to hangout. But the line is always long here! 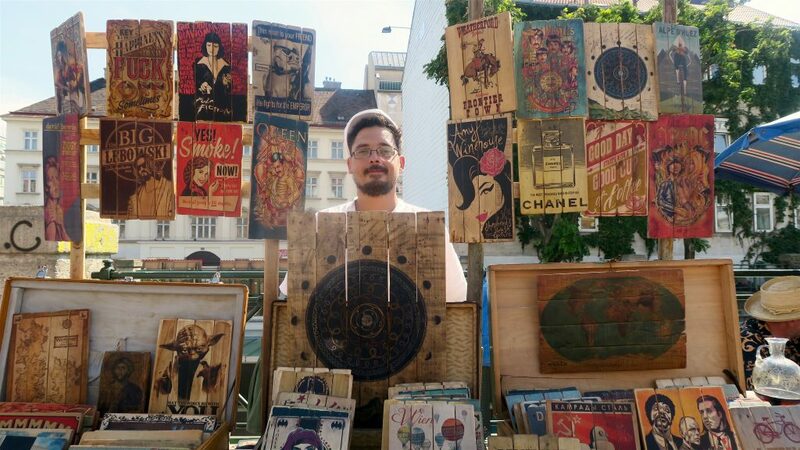 Come when you have plenty of time to kill :).Address: Herrengasse 14, Vienna. Another one that I visited is Cafe Korb. A 110 year old institution coffee house in Vienna. My school mate, Przemek, told me that famous local people often come here to have coffee or casual meetings. And I also noticed that the locals love to spend hours here, playing cards (provided by the coffee house) and having a good time with their friends! 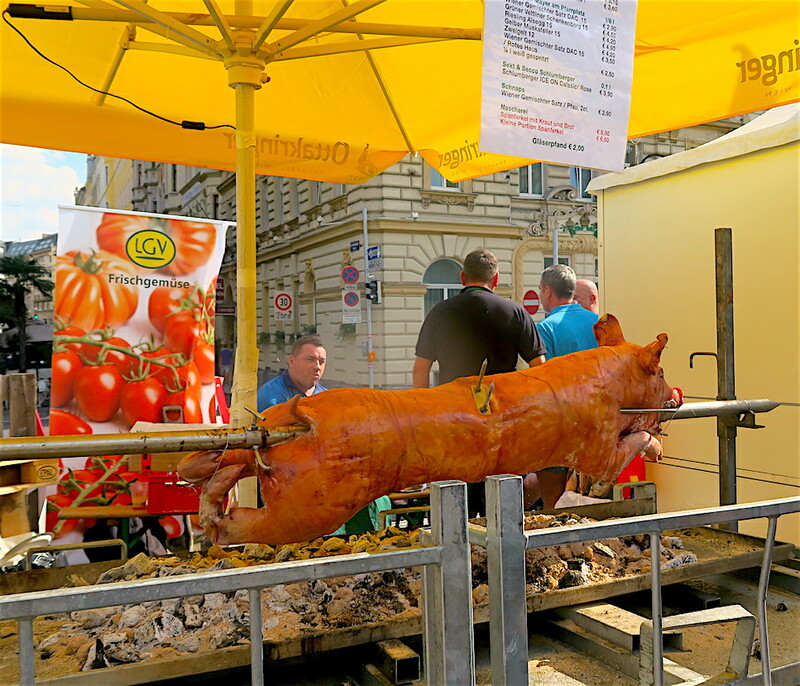 Previous articleImpressions on Vienna, Austria… my 34th Visited Country So Far! Next articleLittle Explorer on NET TV: Me and My Baby’s First TV Show!